I cannot recommend Anita @ Catnips service more. I was at the end of my tether worrying about my ragdoll who seemed to have terrible hair ball problems and was sick a lot. Anita really spent time talking through our situation and e mailed loads of advise and information above and beyond our expectation of the service and made it clear we were under no obligation to book in a groom. I am so glad we did. 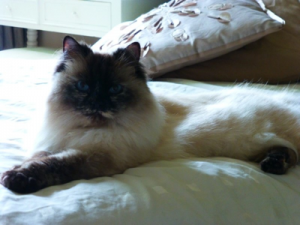 Anita is patient, lovely with your cat and does a fantastic job. My cat particularly hates being groomed and Anita really persevered until my cat was fully groomed and beautiful. Mia has never looked so beautiful.